There are mountains everywhere around the place where I live (northern Slovakia). Ranging from forest covered ones with hills around 1400m high to Tatry with rocky peaks above 2500m. 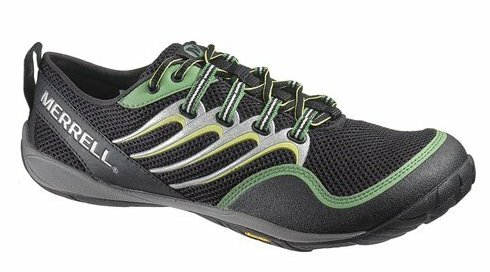 I use to hike a lot and during last 6 months, I have been using my Merrel Trail Glove barefoot shoes almost exclusively. So I would like to summarize some pros and cons of wearing this kind of shoes. The shoes are light and flexible, you can feel many thinks you step onto, but the sole is tough, so it doesn’t hurt even when you step on a sharp stone. Barefoot shoes encourage you to use all muscles of your feet, because you cannot walk like in normal shoes – when your heels take most of the impact. That’s why your knees, back and other joints will be happy. My legs feel noticeably better after a trip, the feet get more tired, but the overall feeling is better, especially the knees and calf muscles don’t hurt. The shoes make a big different of steep descents. Especially in a rocky terrain and with a heavy backpack. The fact that you can step on your toes instead of the heels, you save the rest of your body of many shocks and suddenly you can enjoy it. When walking uphill, you can use your toes again, so your calfs get less stretched. Stability of the feet is good. Your feet are closer to the ground and you can feel what you are stepping on, so your body can react earlier. Also when you step on something like a stone or a piece of wood, your foot grips it. The sole is not wider than the shoe itself, so when the ankle bends, it is easier to get it back and not having it sprained. The shoes are not warm. It’s a clear advantage in summer. But you can wear them even if it’s cold outside, because your feet get warmer thanks to using their muscles and you can wear warm socks too (not in Vibram FiveFingers). The shoes are perfect for stable and dry tracks. When it’s wet, your feet get wet very quickly (I always carry an extra pair of socks). The sole is made by Vibram, there is a good pattern on it, but it’s easy to slip when the ground is wet, because the heel is low. The shoes are not very suitable for unstable terrains like gravel or forests with thick layers of things on the ground, because the shes are low and small things get in easily. They don’t protect your ankles, so there is a risk of damaging them when walking on loose stones. Nowadays, the number of people wearing barefoot shoes when hiking is rising. They cannot replace traditional hard boots, because you cannot wear them all year and in all kinds of weather, but I think they are the best kind of shoes for stable and dry tracks. Could you comment on missing ankle support which boots provide? I’d feel a bit uneasy in rocky terrain when the shoes end at the ankle. Hi, the shoes give no protection for the ankle. I use to wear thick outdoor socks, which make it better. But since the heel and the whole foot is very low, its stability is good. And you can feel the terrain through the sole, so your body can adjust to it faster than when wearing heavy boots. In fact, I have been hiking in these shoes with a sprained ankle (football accident) since August and I haven’t had a problem. But I started using a hiking pole for better safety.